One of my favorite places to fish is Middle Decatur Bend. 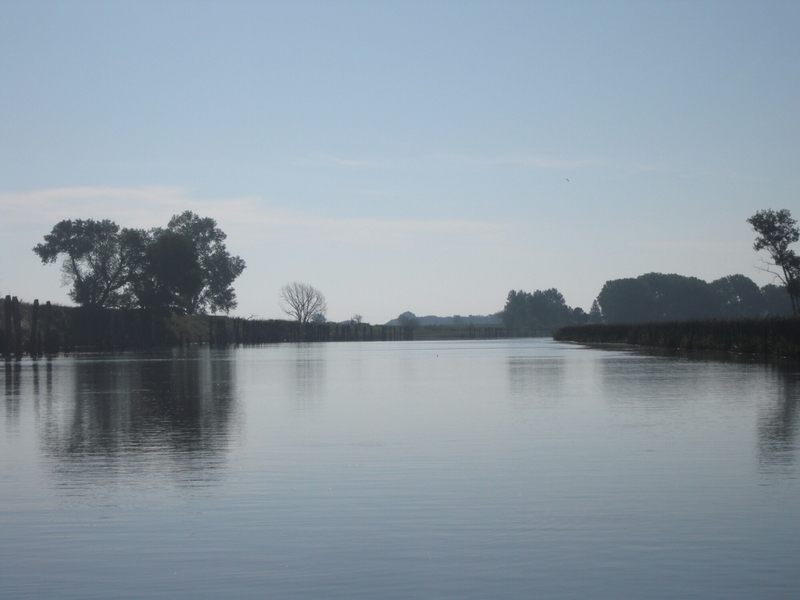 I go out there because of the fish diversity and also because it is a relatively unknown place to fish. It is an oxbow lake off of the Missouri River about an hour north of Omaha. For the most part the lake is shallow (less than 5 feet) but on both the east and west sides by the tall log pilings it does get to 8-10 feet deep and some spots even a little more. I started the day throwing spinner baits and a plastic worm around the wood on the west side. I fished for a couple hundred of feel and didn’t get a bite so I skipped further down the line and tried at deeper spot and didn’t get any bites. The canal leading to the river must have been all the way through because I saw 2 different boats come through and then leave. 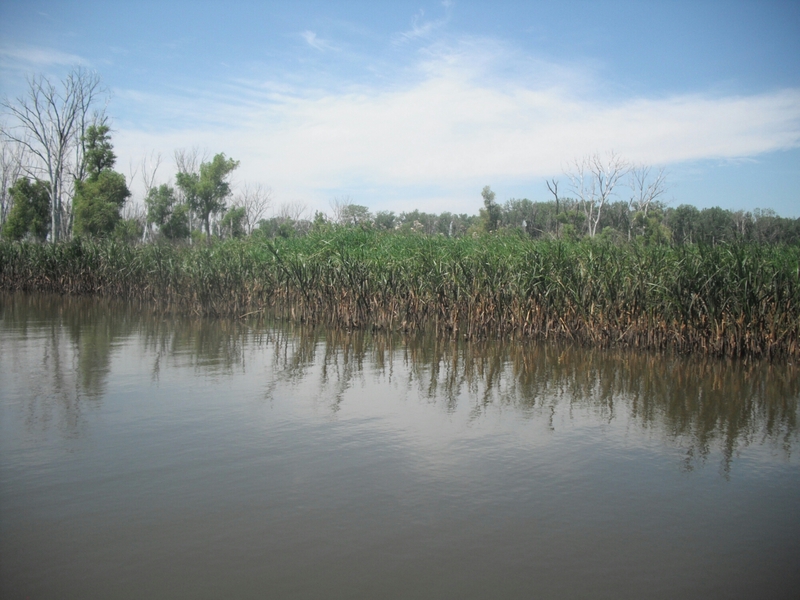 But as I was near the canal I saw and heard some fish in the shallow grasses. As I got closer I realized they were mostly carp with a few gar but usually where some fish are the others will follow. I started throwing a white spinner bait around the grasses and cat tails. I caught two gar right off the bat, they are nasty creatures but there were plenty around to catch. I shortly after caught two small large mouth bass. It was nice to catch the fish I had been looking through, although I was a little disappointed I didn’t catch any Walleye or Northern Pike. Still a fun place to go and I will definitely go back! 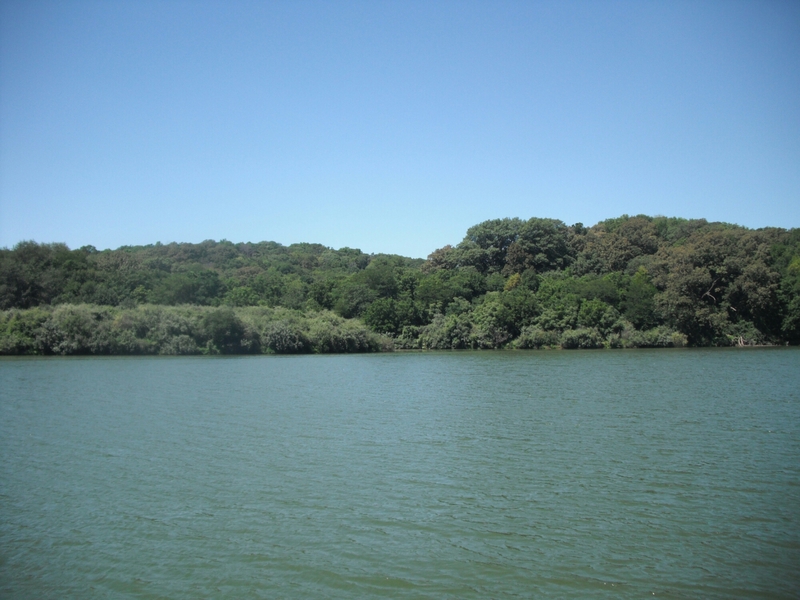 This lake is a lot of fun to go to, I really like it but it is a little difficult to figure out. I like being able to catch nice bass and northern pike but it might be a little better without the gar or all of the carp in the area. Today I had just a couple of hours in the afternoon that were open and the weather was great so of course I have to find some way to fish. I hadn’t recharged the battery for my boat and didn’t have a lot of time to drive somewhere anyways, so I just grabbed a box of worms and went down to a part of the creek that is just around the corner from my house. Papio Creek really fluctuates a lot in water clarity as well as depth/current depending on how much rain we have had lately. But fortunately for me there wasn’t much rain this week and it was pretty calm and clear! If you have never explored the creek it is a very cool place. You can access it from many different areas around the city and once you get down into the creek its like you have just entered a whole other area where it feels like you are miles away from the city. And there are some truly beautiful places along the creek that are a lot of fun to explore. Today I found one area where the creek had some depth but opened up a little bit and tied on a catfish line with a worm and just sat down and relaxed. I didn’t catch much but had 3-4 little catfish bite my line and they were fun to see in the water and they all seemed pretty healthy! The creek is a very fun place to explore and you can always see other kinds of wildlife while there. I saw raccoon tracks, a pair of mallards and a pair of wood ducks. But the fish are usually pretty small. It is a small creek so I wasn’t expecting anything big but bigger than 6-8 inches might be nice! As I was at my parents house watching some basketball and what better to do during halftime than try and catch some fishing at my parents private pond! Most of our fishing equipment was still packed up for winter but we had a couple of poles that still had string and lures on it. So we just grabbed them and fished with whatever was on. I had a a baitcaster with a spinnerbait and my dad had a spinning reel with a senko on it. It didn’t take long before we both started catching fish! I think this might have been the earliest in the year that we had both caught a fish. We didn’t fish too long but I think we both caught two nice healthy fish and then went back in to watch some basketball! Who could ask for a better afternoon! Some of my friends wanted to do a picnic and take the dogs to the dog park at Walnut Creek today so of course if I was at the lake I was going to do a little fishing! By the time we were done with the picnic I only had a short time to fish but made the best of it. 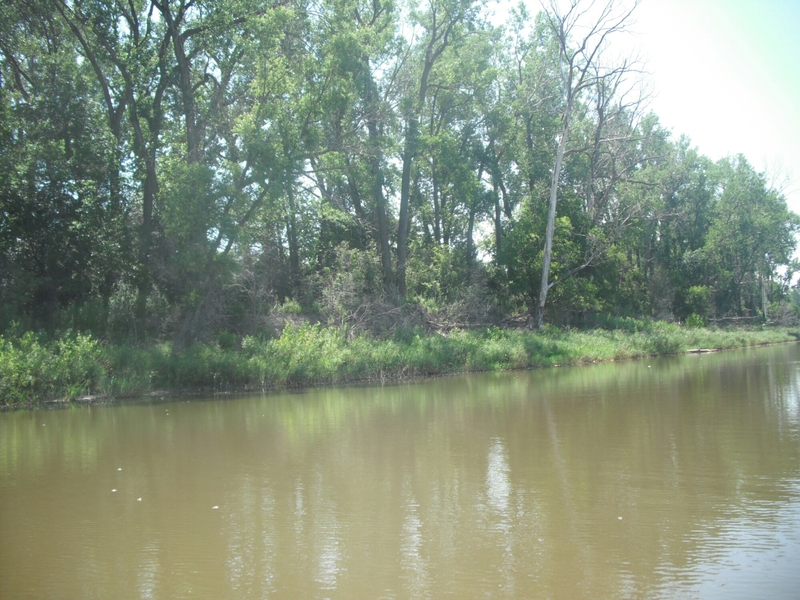 This lake has such a defined creek channel with a lot of standing trees that are always temping to fish. 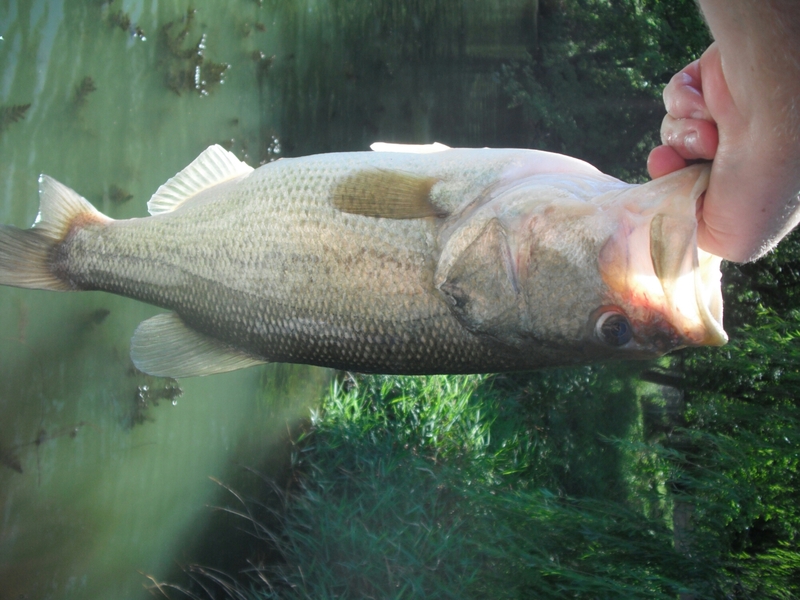 So I started there, fishing a crank bait, pig and jig, and a few other soft plastics around the trees with not luck. I quickly moved to fishing around the Island on the west side of the lake. Most of the shoreline around the lake has really thick matted vegitation but around this island. 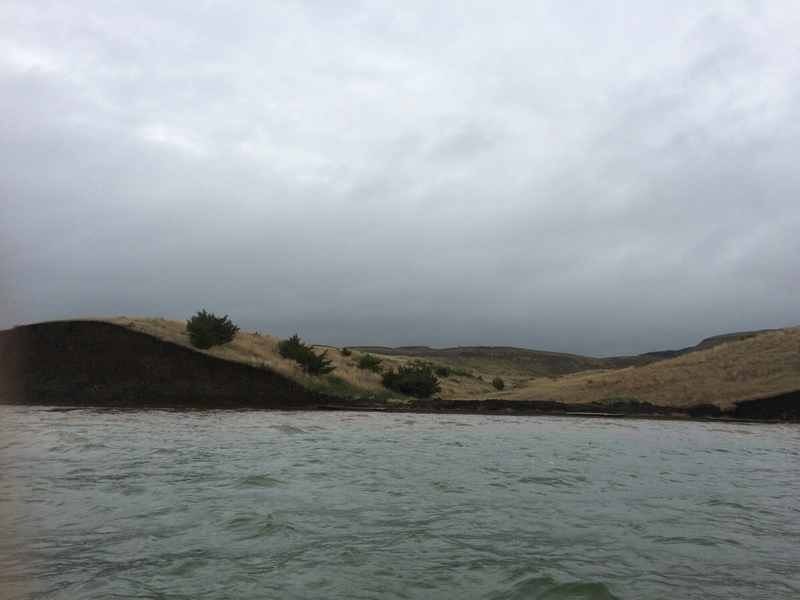 I positioned my boat on the side that was protected from the wind and I cast a crank bait out into the windy current and let it bang the rocks on its way back to me. I immediately started catching fish! All were pretty small but they were aggressive and fun! I caught about 8 this way before I had to start moving back towards the ramp so i didn’t get stuck out in the dark. I caught one or two more on my way back. I even tried jiggin in the trees for a few minutes trying to catch crappie without any luck. 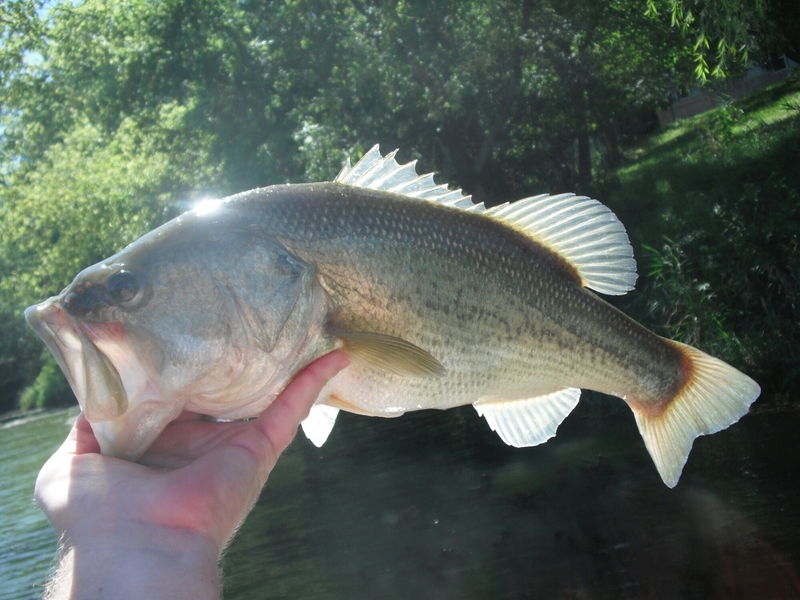 But for how short the trip was I couldn’t complain about 8-10 bass even if they were small. This lake always makes me think I could catch a big one on any cast but I have yet to do it! There is plenty of structure to fish and there are fish in there but from my experience they are fairly small. Today I had a few hours after I got off work and had planned on going fishing all week. I was a little concerned because there were storms coming this evening but they seemed to be heading around the metro area so I figured I would head out and if things looked like they were getting bad then I could always get off the water. It made for some great pictures though when there were storms to the north and south of the lake and I was stuck in the calm spot right in the middle. 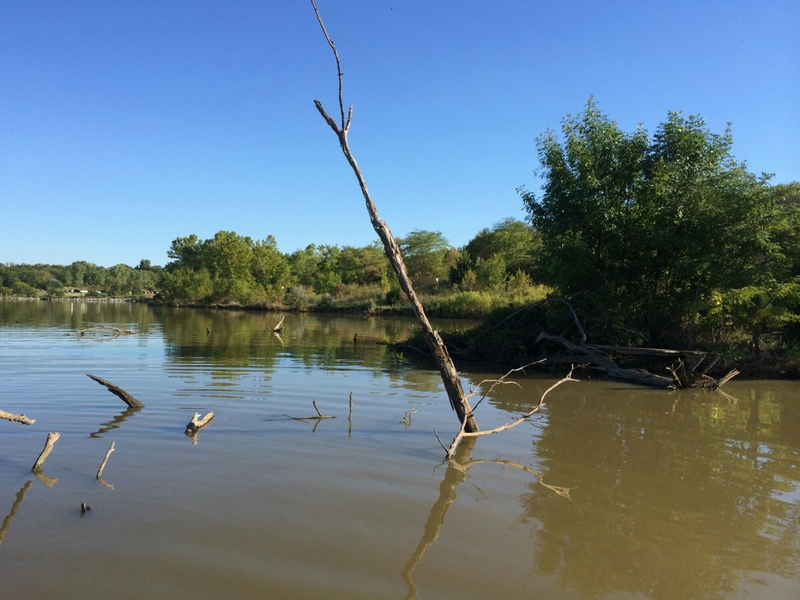 I started off by fishing around the flooded trees on the south side where I have caught fish before and and didn’t even get a bite. I didn’t stay around there long before switching to the bank on the north side and along the dam. I had caught one bass at this point but hadn’t really determined any kind of pattern. 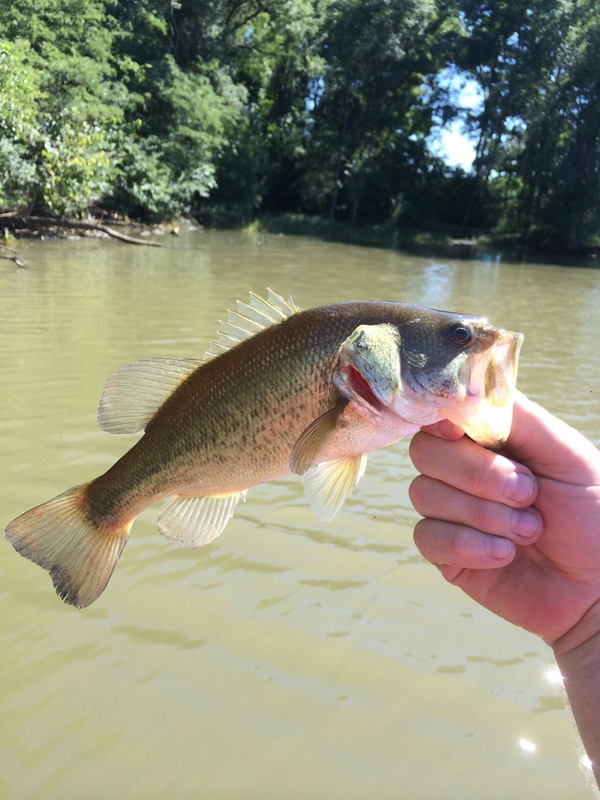 That is until I was casting a heavy pig and jig next to a log on the shorline and didn’t find anything next to the log but as soon as I hit the grassline about 3-5 feet off of the bank and tried to rip the jig out of the grass I got bit. I ended up catching 3 fish pretty quickly with this same pattern. 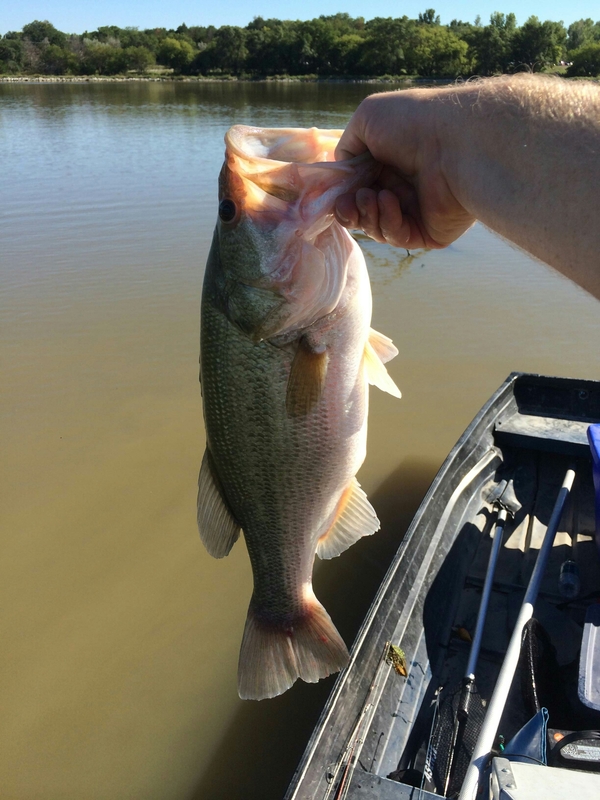 I would cast the jig close to the shore line and as soon as I would start to hit the submerged grasses I would give it a hard rip out of the weeds and the bass were smacking it as soon as it came loose. 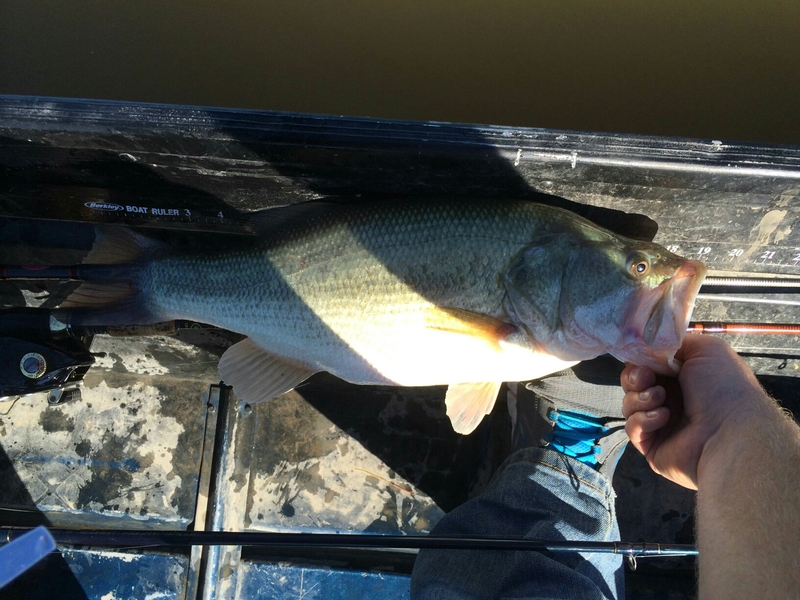 I fished all the way down the dam and on the east side of the lake and ended up catching about 7-8 bass of decent size before it started to get too dark and I got off the lake! Although I did witness something unusual today, as I fished near the apartment complex on the east side and got to see a young man propose to his girlfriend! I took a quick picture but he did a good job and she said yes! it was pretty fun to witness. I rank this lake a four star only because the size of the fish are not very big. I like the lake and can catch plenty of fish. 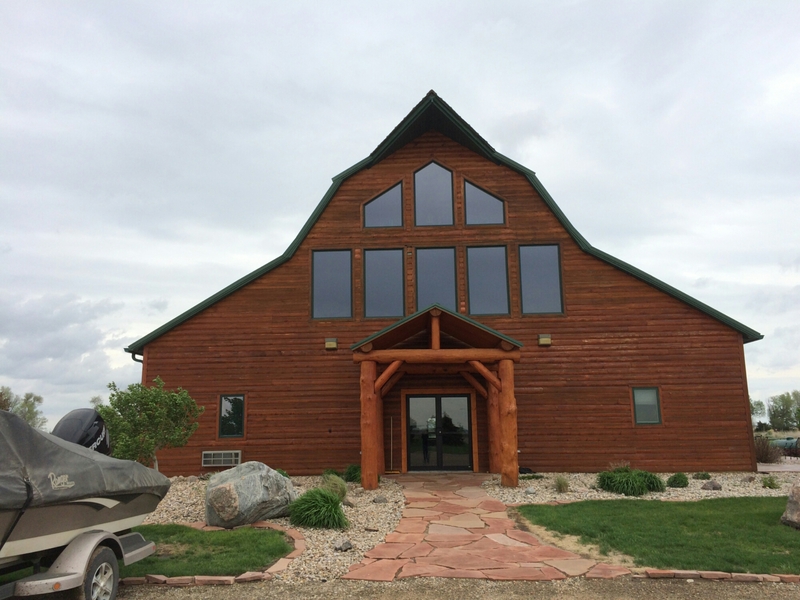 It is in a great location and is well built. If you only have a couple of hours or if your are taking a kid fishing this lake would be a great place to go. 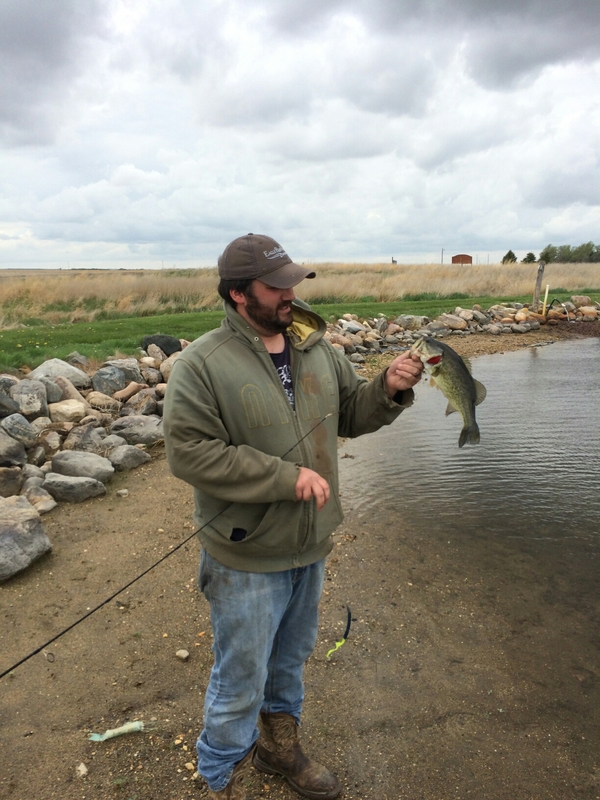 Made the trip up this weekend to visit some friends in South Dakota and Nate took me out to the lake to try for walleye. I have never been fishing exclusively for walleye before and new this would be a new experience! 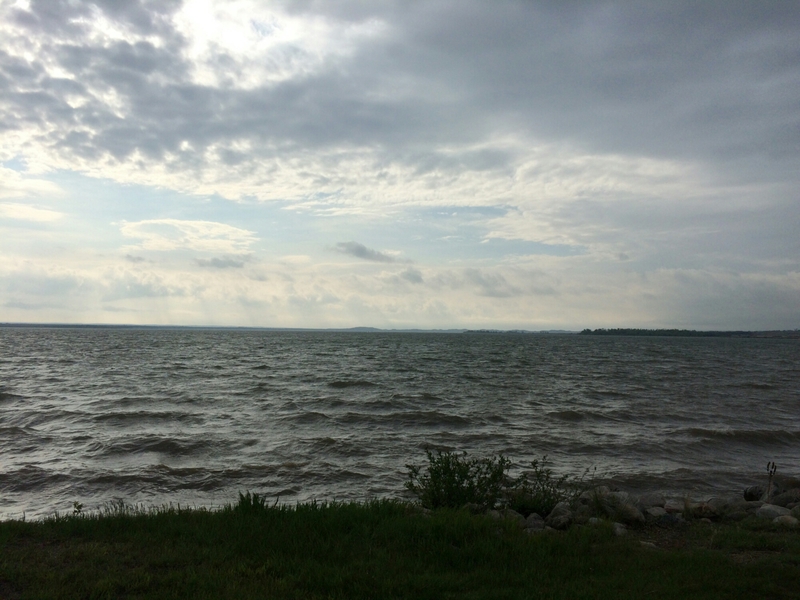 We got out to the lake early and were trying to beat some storms that were supposed to come that afternoon. 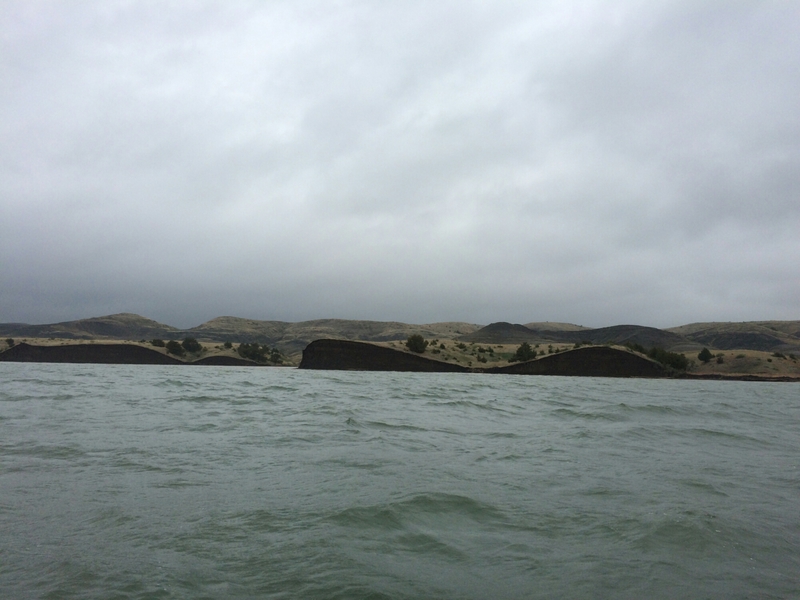 When we got to the lake it was very windy and there were large waves beating the shore. But in his ranger deep v boat we had no problems cutting right through them. Once we got to our first spot we started trying to run spinners over the flats. But immediately we noticed some issues with the telling motor and the front fish finder. After a free minutes of trying to find the problem we decided to move on and try to troll crank baits along the drop off points and ledges and then along weedlines near the shore. We did this for an hour or two without even a strike so we tried a few minutes for small mouth bass but without the telling motor this was difficult too. Since we didn’t have much luck at the lake Nate took me to a private bass pond out at Eagle Pass Ranch since we were determined to catch fish. At this pond we caught tons of 2lb bass on a worm and chatter bait and had a lot of fun. I definitely want to come back some time and try the lake again. It was beautiful and all the reports said that the walleye and small mouth fishing was going well. The only reason I didn’t rank it a 5 was that we couldn’t find the fish, I definitely want to try it again! 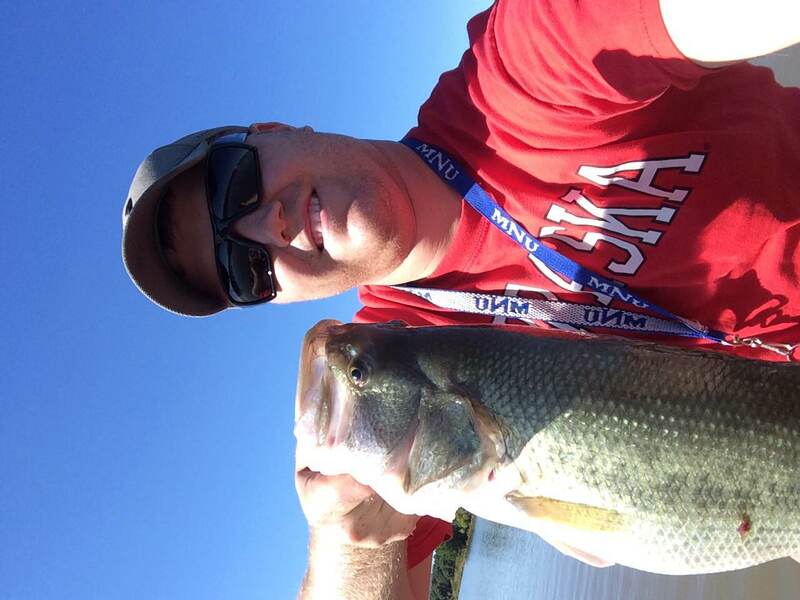 Today the huskers played at 11:30 so when the game was over I still had a few hours that I could go out fishing. 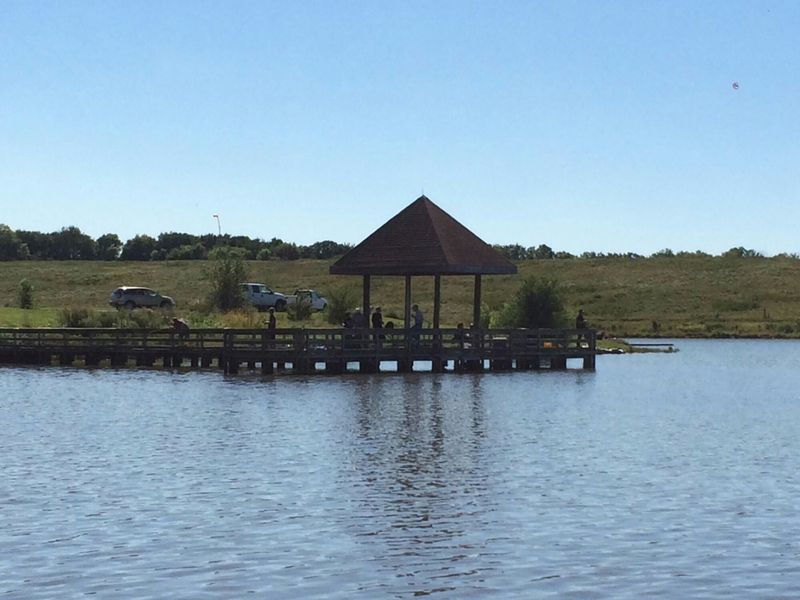 I had not been to Zorinsky before and had actually stayed away because it was recently drained and I wasn’t sure how the fish population would be. We had so much rain over the past few days that I knew the water would be muddy and I thought the fish may be around the dam since I could see quite a few crawdads sun bathing. Fishing along the dam though did not produce any bites. At the south side of the dam the were some bushes that I fished around and caught one fish on a bright chartreuse spinner bait so I headed towards the west side of the lake to fish more sunken trees. Just on the west side of 168th at there are trees everywhere and most of them are in good depths of water by the channel. I started throwing a large black worm and hooked into a 20 inch hog! I weighed it and it measured 4.75lbs! I was completely surprised and had no idea there were bass this size on Zorinsky. I caught 1or 2 more before deciding to go home and watch some more football! What a day! 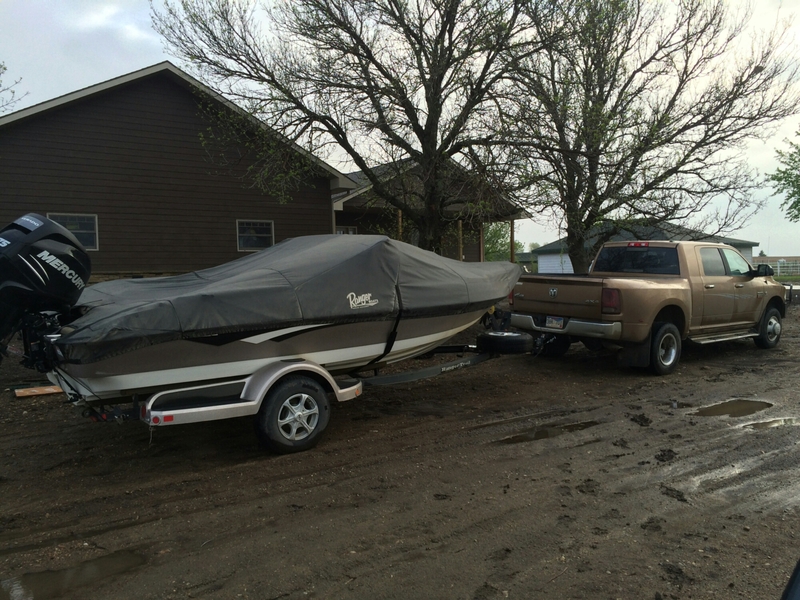 Good boat ramp and lake structure. There was good depth with docks, rocks and trees to fish around. We caught fish but it was a little slow and it is a crowded lake. Today I went by myself in the afternoon for a few hours to a lake I had driven by a few times. My dad had told me he used to fish this lake a long time ago but I had no recent reports. The boat ramp I choose was steep and I hadn’t realized there was a different one until I was leaving. The lake itself had surprisingly clear water and deep as well, it for to 25ft deep in the spots of the channel I went over. 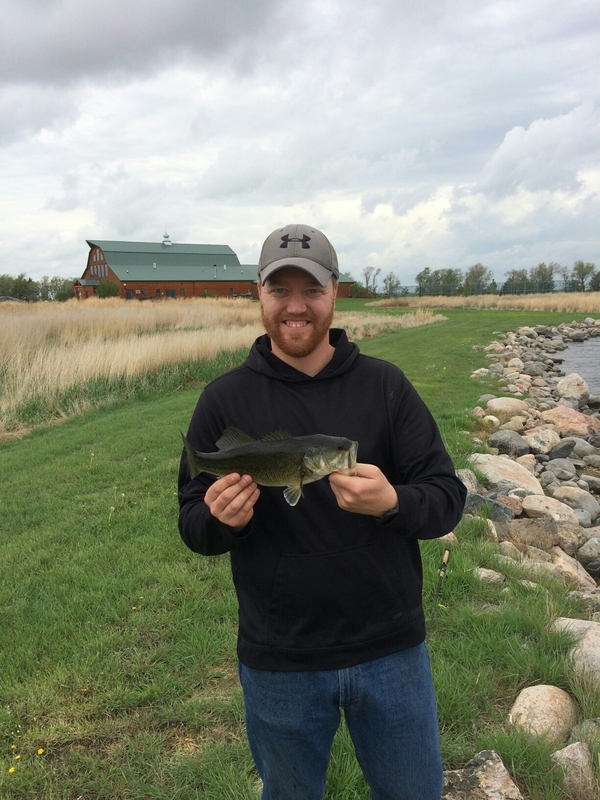 I fished all the way up the west side and started catching a few fish on a Scheels brand spinner bait and a pig and jig. After a few minutes I hooked into something huge and it took me a really long fight to get in. Once I did it ended up being an 18lb flathead that I got so excited about catching that I released it without remembering to take a picture! 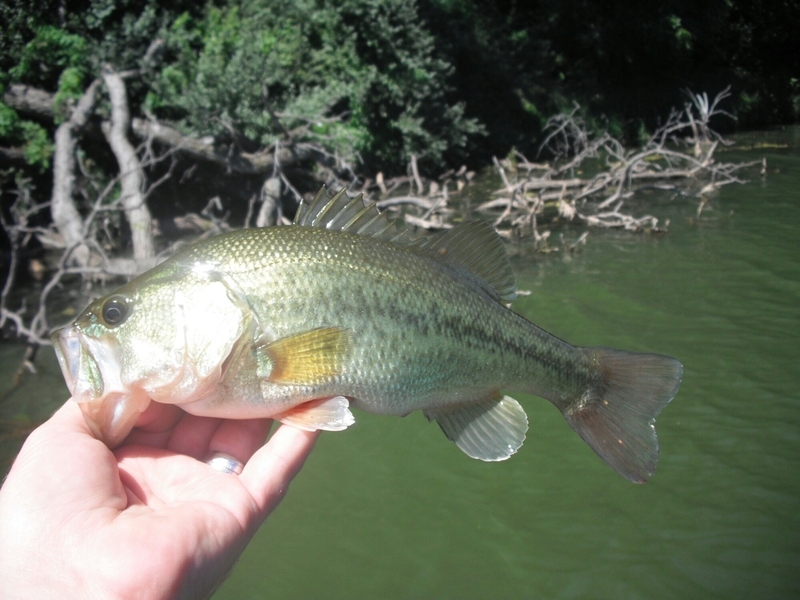 I did end up catching 10-15 bass all between 12-17 inches. 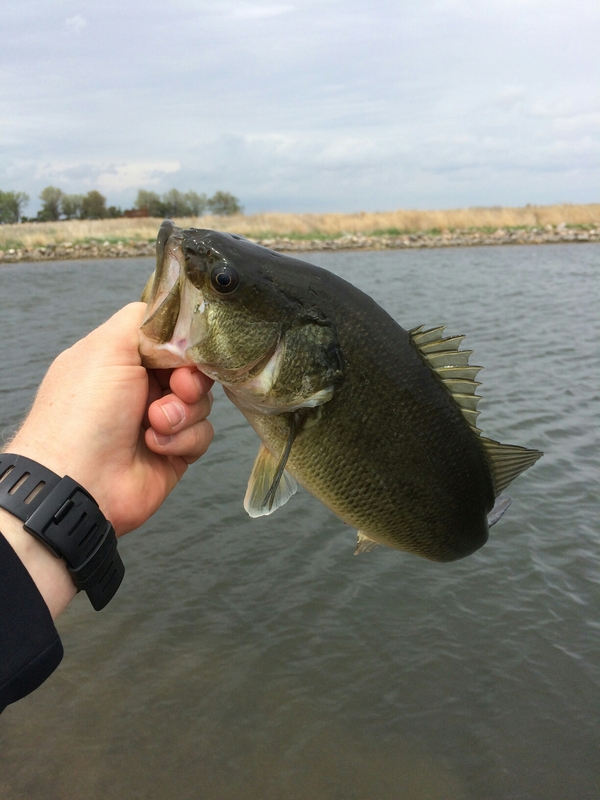 They seemed to be healthy and this lake was a fun place to fish and was very close to Omaha. I will be definitely be going back in the future. This lake is great size, depth and location. It was very beautiful being in the hills and the fishing was awesome. The only reason I didn’t give this lake a 5 star ranking is because the boat ramps were not in good shape and did have a dock at them. Had a day off in the middle of the week and decided to head back to one of my most intriguing spots. I choose this spot one for the bass fishing and multiple other species and two because I wanted to do some scouting for deer season! 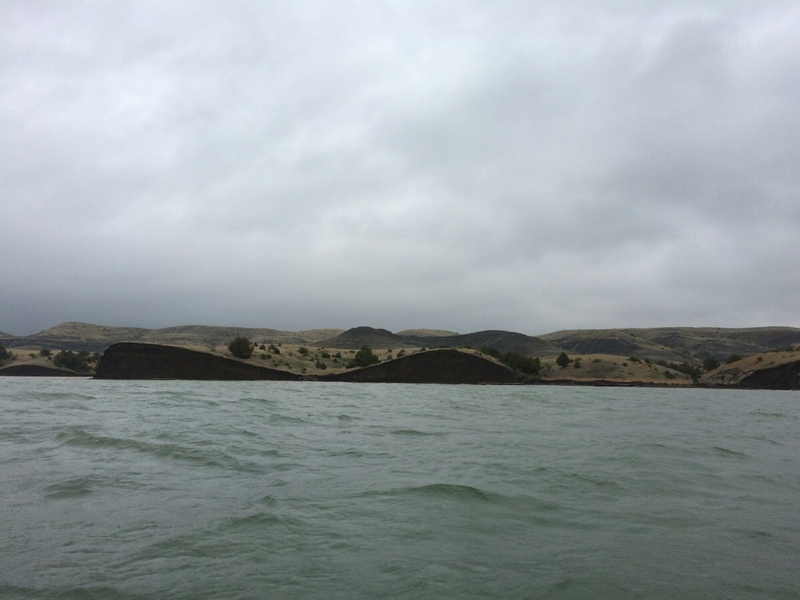 This was the first time I have fished this lake with a depth finder and to my surprise it actually gets pretty deep, in spots up to 18ft deep. Still see a lot of Asian carp and gar but today I actually didn’t find the bass like I had on my previous trips. 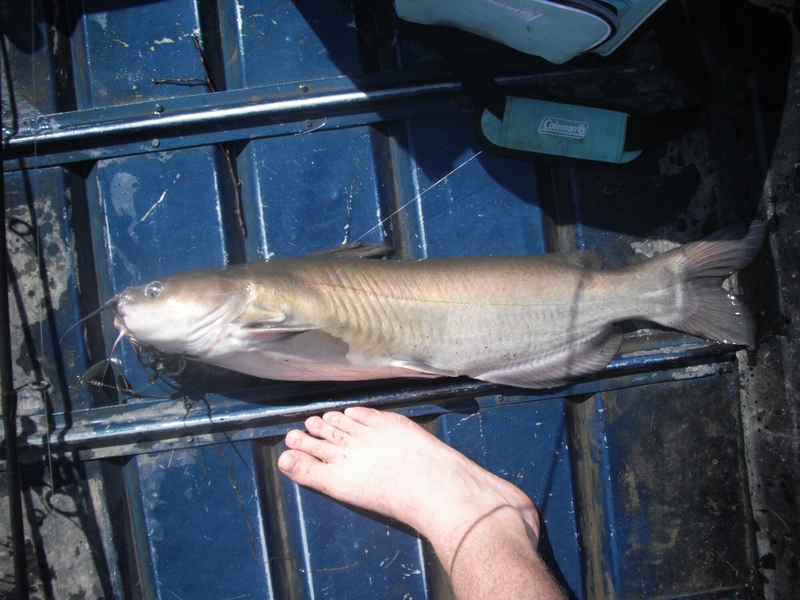 But I did end up catching an 8lb channel cat on a spinner bait. 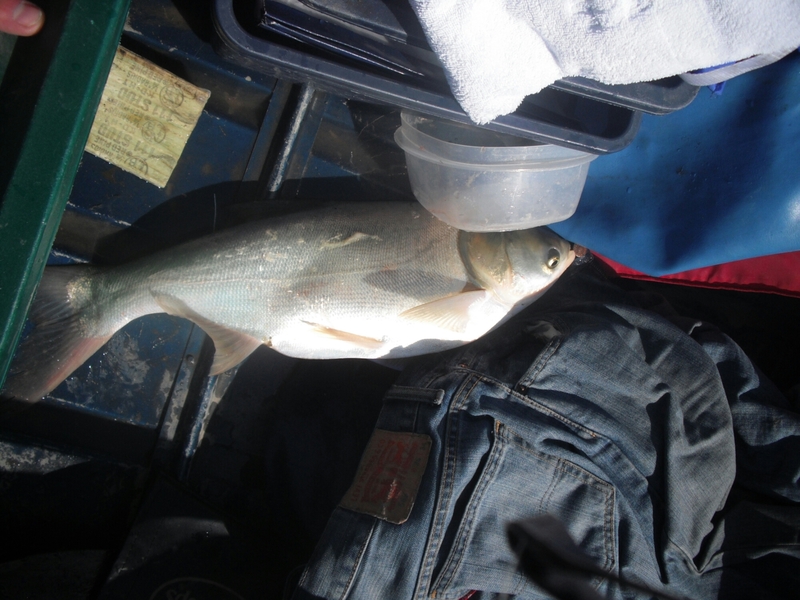 Then finally one of my dreams came true and an Asian carp literally jumped into my boat! Pictures below. Also found the necessary information I need for deer season! So even though I couldn’t find the bass or was still a fun day on the water! This like is kind of a little gem, good fishing with multiple species. The view is great and its only an hour drive from the metro area. 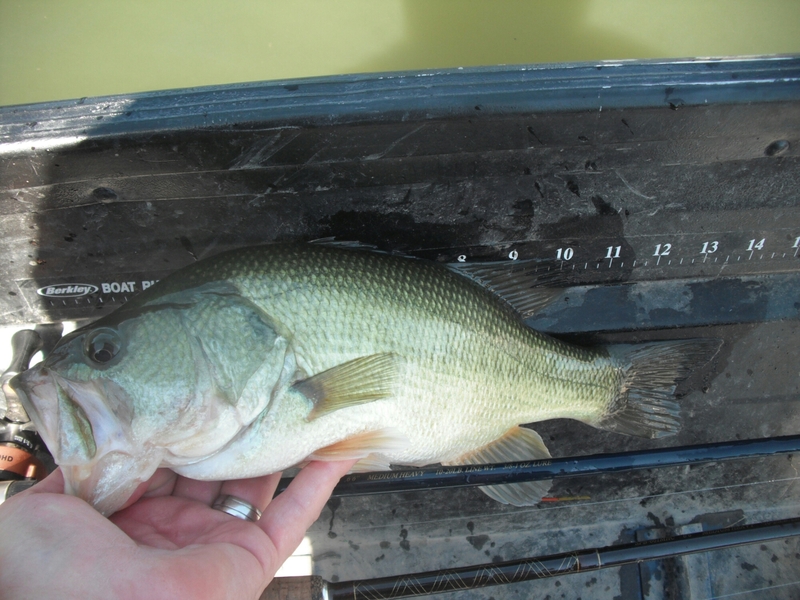 Overall fairly shallow and there are a lot of undesirable species as well.